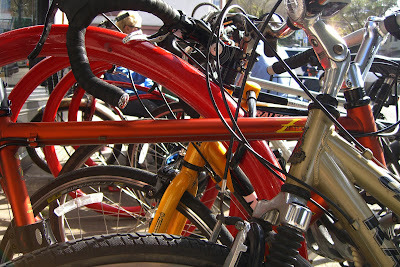 Certain cafés in San Francisco attract cyclists, Velo Rouge on McAllister and Arguello being one of them. I spent the majority of the late morning/early afternoon there yesterday. 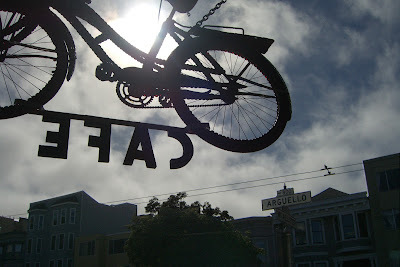 The bike path that leads to the Golden Gate Bridge passes right in front of the café, and cyclists sporting all sorts of attire pass by. 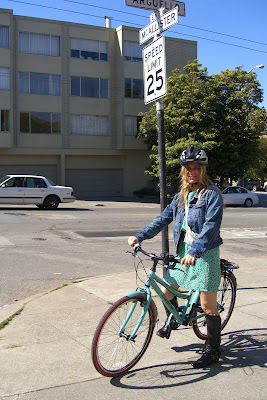 Here's a lovely blonde cyclist donning a green patterned dress on her green Bianchi, fit for springtime.